Springfield Punx: They Won't Let You Remember... Again. They Won't Let You Remember... Again. Well, it doesn't make much sense to draw Jay without also including his elder partner Kay, does it? 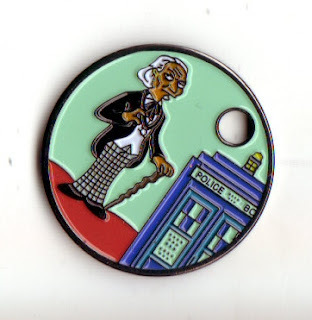 I also wanted to share a cool creation with you today - Michael sent me a couple Pathtags (which are a little medallion type treasures made for geocaching) based on the First Doctor Punx from this blog! Thanks Mike! where can we get the path tags? why don't Boris the Animal and younger K, its to be better.